Veronica was born and raised in Dallas, Texas. Before working at Synergy Dental, Veronica worked in a rehabilitation clinic with the Department of Labor. She will usually be the first person you communicate with, whether by email, phone, or in person since appointment scheduling, insurance questions, and any kind of correspondence are her specialties. She truly enjoys helping others and making you feel comfortable when walking through our door. “The amazing technology at Synergy Dental gives the patient an opportunity to see the condition of their teeth with their own eyes. Combined with Dr. Sudhi’s conservative suggestions and treatment plan options, the patient can make their own informed decisions. 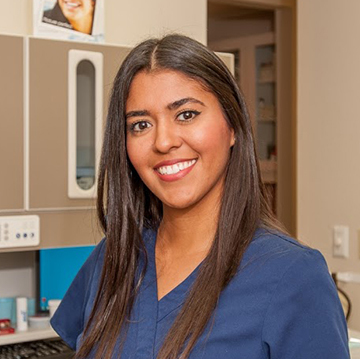 The honesty and professionalism of our team is second to none.” When she is away from Synergy Dental, Veronica enjoys eating delicious foods, spending time with her family and friends, and is dedicated to her faith.